(Nanowerk News) Researchers at the Georgia Institute of Technology have received a $900,000 grant from the U.S. Air Force Office of Scientific Research (AFOSR) to study the unusual chemical and physical properties of atoms and molecules at ultra-cold temperatures approaching absolute zero – the temperature at which all thermal activity stops. Developing and employing advanced computational methodologies, they will explore the formation of novel types of molecular aggregates at these extreme conditions, where quantum mechanical principles govern and dramatically alter the ways that atoms and molecules interact. The work could help provide a better understanding of the reaction processes underlying strongly correlated atoms and molecular quantum systems in conditions unlike those seen in conventional chemistry. Absolute zero is the temperature at which all thermal activity stops. The researchers will be studying matter at ultra-cold temperatures, which are in the micro-kelvin or nano-kelvin ranges closely approaching that level. At these extremely low temperatures, atoms and molecules move much more slowly and have different kinds of interactions. These atoms and molecules interact via their wave nature, with interference between waves either destroying or amplifying one another. At these ultra-cold temperatures, the wave nature of matter also changes. For instance, the size of the de Broglie wavelength is inversely proportional to the square of the temperature, meaning wavelengths become larger as the temperature drops. “The wavelength of a particle, say a lithium atom, taken from room temperature to one nano-kelvin, grows by a factor of about 600,000, from about 0.04 nanometers at room temperature to 24,000 nanometers (24 microns) at the lower temperature – which is a very dramatic change,” Landman explained. In conventional chemistry, activation barriers must be overcome before atoms can exchange electrons to bind together. Because they have so little energy at ultra-cold temperatures, atoms cannot overcome this activation barrier, meaning interactions must occur through other mechanisms – including quantum tunneling effects. And at these conditions, quantum mechanical effects become more pronounced, with the long-distance entanglement of atoms affecting the physical and chemical states of the matter. “These are pure and deep quantum mechanical objects, and they exist only at these low temperatures because the wave effect takes over,” noted Landman, who is also director of the Georgia Tech Center for Computational Materials Science (CCMS). The ultra-cold temperatures will allow study of synthetic solids created by the formation of optical lattices that control the location of atoms at ultra-cold temperatures. Over the past two decades, scientists have learned to trap neutral atoms by lowering their temperature and building optical structures from laser beams to capture these slow-moving atoms. 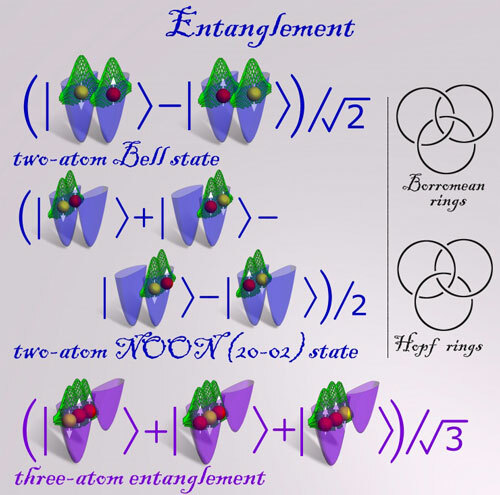 The two diagrams on the right serve to illustrate the concept and different modes of entanglement (three-atom entanglement, in particular). The diagram at the top displays the coat of arm of the Borromean family, owners of the Borromean islands on Lake Maggiore in northern Italy. The rings express the idea of ‘united we stand, divided we fall’ – indeed, the rings are entangled with each other, in a manner that if one of the rings gets broken, the other two will not remain linked as well. On the other hand in the case of the Hopf rings, the three rings are entangled in a way that if one of the rings is broken the other two remain interlocked. These diagrams point to connections between quantum mechanical entangled states and topological characteristics of knots. The physical phenomenon of quantum entanglement occurs when groups of two or more particles (for example: photons, electrons, atoms) are prepared or interact in ways such that the quantum state of each individual particle cannot be described independently. Instead, in the entangled state the quantum state may be given for the system as a whole; mathematically, such states cannot be expressed as the product of the states of the individual constituents of the system. 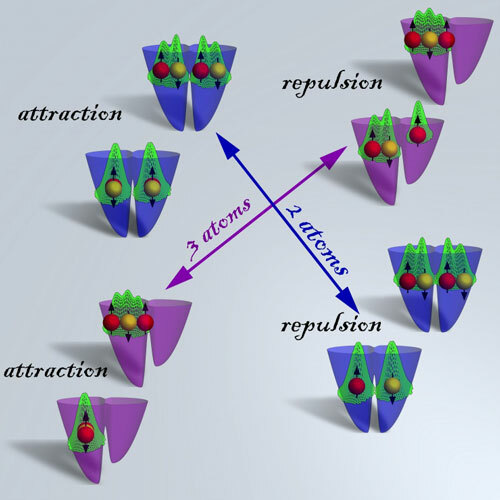 A two-atom maximally entangled state (called a Bell state after the Irish physicist John S. Bell who described it first in the 1960s) is shown as a superposition of two states in the first row; the total density distribution of the atoms is shown in green, and atoms with up and down spins (white arrows) are depicted by the red and yellow balls, respectively. In the second row we display a N00N [here (20-02)] state, where in each of the four superposed configurations, the two atoms are either in the left or right potential well, with the strong repulsive interatomic interaction bringing about formation of a Wigner molecule in each of the four configurations; the 2-atom Wigner molecule corresponds to the two-humped density distribution (green); pairs of Wigner molecule configurations form Bell states. Such entangled states are of importance in quantum information. A three-atom entangled state (named a W-state) is shown in the bottom row; here too the strong repulsive interatomic contact interaction leads to formation a 3-atom Wigner molecule. By constructing layers of atoms held together in this way, scientists can create synthetic solids that are unlike any materials that can be created at conventional chemical reaction temperatures. “Instead of chemical bonds, what holds them together are photons of light from the laser beams,” Landman noted. In conventional systems, thermal noise acts as a veil to prevent direct study of certain phenomena. By nearly eliminating thermal energy at these ultra-cold temperatures, researchers will be able to study interactions without these complicating effects. For more than three decades, Landman’s research group has been studying the interactions of matter using advanced computational techniques. In this new research, those techniques often complement experimental work, enabling an iterative process that more rapidly leads to results. Studying matter in these extreme conditions will require new computational techniques. “We can apply these methodologies of ultra-cold atom simulations to solve problems that we cannot solve otherwise,” said Landman. “We will attempt to revolutionize the ability to compute things that aren’t computable at this point. Experiments with ultra-cold atoms emulate an analog-simulator mapping onto the requisite microscopic Hamiltonian, approaching realization of Richard Feynman’s vision of quantum simulators that ‘will do exactly the same as nature.’ In our work, we develop and implement exact benchmark computational microscopy solutions of the system Hamiltonian, uncovering the spectral evolution, wave function anatomy, and entanglement properties of the interacting fermions in the entire system parameter range. In this way we may address some outstanding problem, like high-temperature superconductivity, quantum magnetism, highly correlated quantum systems, and chemistry at the ultra-cold extreme,” he added. All of this makes for exciting new science that is being explored both experimentally and theoretically at nearly a dozen laboratories around the world. Landman and Yannouleas hope to use the strong background and expertise of the CCMS in computational physics and materials science to make contributions to the computational techniques and modeling used to study these effects. The CCMS recently published a paper on this topic, “Double-Well Ultra-cold Fermions Computational Microscopy: Wave-Function Anatomy of Attractive Pairing and Wigner-Molecule Entanglement and Natural Orbitals”.